Roland, Browse & Delbanco, London. The Hon. Lord Radcliffe, Great Britain, by circa 1958. Marlborough Fine Art, London, by 1964. A. Salomon & G. Cogeval, Vuillard - Critical catalogue of paintings and pastels, vol. III, Paris, 2003, no. XII-190 (illustrated p. 1554). Nottingham, University Art Gallery, Impressionist and other pictures from the private collection of the Rt. Hon. Lord Radcliffe CBE, February - March 1958, no. 24; this exhibition later travelled to Bath, Holbourne Museum. The present work depicts a corner of the bedroom of Lucy Hessel reflected in a mirror at the Château des Clayes near Versailles. The Château des Clayes was the estate owned by Vuillard's long standing friend and art dealer Jos Hessel. Together with his brother, Gaston, Jos Hessel ran Galerie Bernheim-Jeune. Vuillard met the Hessels in 1900 while visiting Felix Vallotton near Lausanne, and they quickly became friends. Vuillard was a frequent visitor to the Hessel's Parisian appartment and from 1925 to the end of his life, the Hessels put the Château des Clayes at the artist's disposal, so convenient for him because of its proximity to Paris. Painted in the early 1930s, Réflexions dans le mirroir au-dessus de la cheminée is a tour de force of Vuillard's quiet observational style and testament to the artist's rare ability to imbue even the most unlikely of subjects with a power and vibrancy all his own. In a manner reminiscent of his great intimiste family interiors of the 1890s, Vuillard chooses the most challenging of viewpoints and one which allows him great freedom in his depiction of depth and space. In fact, such is the complexity of the multitudinous use of frames - between the mirror frame, the door frame and the window frame - and the duality of reflections that play with the viewer's notions of space and imagined depth, that the painting almost trancends its subject matter, becoming instead a semi-abstract study of shape and form. 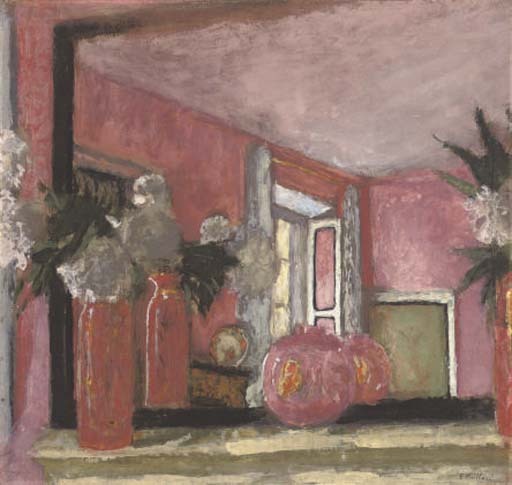 Vuillard further enhances these decorative games with his innovative use of colour: far from the dark, earthy palette of his usual interiors, Reflexions dans le mirroir au-dessus de la cheminée is a chromatic feast of reds, pinks and whites, all anchored by the beige of the mantelpiece and doorway beyond and the natural light pouring in from the open window, which, with a wonderful capacity of observation typical of the artist, Vuillard has also depicted hitting the left side of the vase in the foreground as it is reflected in the mirror.